One of the most visited villages in Tana Toraja Regency is Buntao. Travelers often come to this location for sightseeing and witnessing local culture. The best time to visit the village is during the market day. That means you may see more people and interesting objects there. Just like other villages in Toraja, Buntao also has Patane. 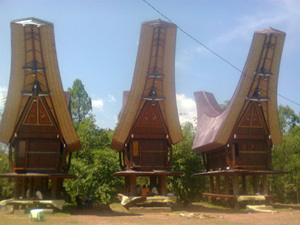 It is a burial site with the shape of Tana Toraja traditional house. Another good feature of the village is the hill. In this location, you can find old cemetery. The atmosphere is indeed creepy. Buntao Village has many features. One of them is the Patane. You can witness it freely, in fact. Not to mention there is a formation of Tongkonan. Some bushes and trees are also seen near to this settlement. These features combine into a good and comfortable nuance. Any guests or tourists would definitely love this village. This location is also suitable to for relaxing, too. Thanks to the trees. Some villagers even may invite you to their house. It gives you an opportunity to enjoy their foods, for sure. The question is what tourists can do in Buntao Village. First, it is to observe villagers’ way of living. The best time to visit the village is during the market day. This way, more people are seen in Buntao. Some of them may tell you about the history of the village, in fact. According to the locals, the village was built by Pong Maramba. It was in 1880. At that time, people in Tana Toraja use Buntao as the main location for administration. It covers both Tikala and Kesu’. Buntao Village is located near to Kete Kesu. No wonder, it shares similar characteristics as well. That means tourists can explore the traditional cemetery in Buntao. You may expect lots of skulls in a particular location of such burial site. The other attractions are Tongkonan and local barns. They look quite majestic and attractive. You can either explore or take pictures in front of them. Make sure to get permission from the owner first, though. It is even possible to have dinner with them. In some parts of Buntao Village, you can also find a beautiful landscape such as mountains and hills. There are even some big rocks and caves. The locals use this location to bury their relatives. Once you enjoy such unique objects, it is time to try their local foods. These include Pa’piong. It is a kind of soup with a traditional recipe of Tana Toraja. The other delicious foods to try are Pa’Piong Bai, Pa’Piong Manuk, and much more. When it comes to traditional drinks, the most famous one is Ballo. How can tourists reach Buntao Village? As mentioned before, the location is in Tana Toraja Regency. What you need to do is to take Poros Barru – Makassar Street. It helps you reach the location fast. This route is suitable for those who come from Makassar City. The distance is 316 km and it takes approximately 7 hours and 30 minutes. With a proper vehicle, you can even reach the location faster.